Wind and solar are now competitive with legacy power resources, but analysts expect state RPS laws will continue to drive growth for both renewable leaders and laggards. In renewable energy, the biggest headlines these days often come from its increasing competitiveness. Since 2009, solar PV has seen cost reductions of nearly 80% and wind has cut its installed price in half, according to the latest numbers from Lazard. Those developments have private companies taking notice, purchasing more wind and solar energy voluntarily in 2017 than ever before, and forcing utilities to respond with new rate designs and renewable energy tariffs of their own. RPS laws are used in D.C. and 29 states. They require a specific amount of renewable energy generation by a specific date, usually through utility electricity sales. Of the 120 GW of renewables capacity built since 2000, 56% was at least partially driven by RPS policies. Renewables are now cost-competitive with other resources in voluntary markets, but markets do not offer the certainty of mandates, said Malcom Woolf, vice president of policy and government affairs for Advanced Energy Economy (AEE). In those states, Woolf said, “the trend is increasing [RPS targets] to keep up with renewables’ improving economics." Though each state situation differs, recent analyses show that RPS standards are still delivering benefits for customers and the environment, and that the laws will continue to drive wind and solar deployment in many states. Since Iowa introduced the nation’s first RPS in 1983, there have been approximately 95 revisions to renewables mandates, according to the 2017 RPS report from Lawrence Berkeley National Laboratory (LBNL). In 2016 and 2017, there were 181 proposed changes to RPS laws. Only 13 were enacted — seven strengthening an RPS and six that were neutral adjustments. Only two of the many efforts to repeal, reduce, or freeze mandates succeeded, and one of those was reversed. D.C., Maryland, Michigan, New York, Rhode Island, and Oregon increased their mandates, Illinois streamlined renewables procurement, and Massachusetts passed the first U.S. offshore wind mandate. Kansas terminated its mandate because the requirement had been met. Ohio froze its mandate, but that was later reversed. Most states have seen little difficulty meeting their requirements, ScottMadden Partner Chris Vlahoplus said in an email. Critical factors are the availability of renewable resources and the policy design. The increasing competitiveness of renewable energy compared to other resources means more wind and solar deployment is coming outside of RPS mandates, Woolf said. But in states where regulated utilities are apprehensive or unwilling to buy renewables to replace existing assets, an RPS can be necessary "to get market access." Recent data reflect Woolf’s point on voluntary purchases. In 2016, the portion of new renewables deployed due to an RPS standard fell to 44%, LBNL reported, down from an average of above 60% between 2008 and 2014. The Energy Information Administration expects RPS laws to push renewable energy from 10% of the nation’s retail electricity sales to 13% by 2030. But it expects overall renewables to reach 18% by that time, with voluntary purchases and other drivers adding the balance. RPS standards are "clearly just one driver," LBNL concluded, along with federal tax credits, renewables' rapidly growing cost competitiveness and corporate renewable energy goals. Much of the competitiveness of renewable energy today is built on market experience spurred by RPS laws. From 2000 to 2016, the U.S. increased renewable energy generation by 283 TWh. Of that, RPS standards required 146 TWh of the increase. In the last 10 years, an annual average of 6 GW of new renewables capacity was added to meet RPS laws. RPS compliance costs were up to $3.0 billion in 2015, from $2.4 billion in 2014. That cost was only 1.6% of average retail electricity bills in states with mandates. Caps are expected to contain future compliance cost growth, LBNL said. More significantly, overall benefits are expected to be greater than costs. The price imposed by RPS’s on the power system through 2050 was estimated at no more than $31 billion, or $0.01/kWh, and could benefit the system as much as $31 billion, or $0.024/kWh, according to an RPS cost-benefit analysis by LBNL. The average estimated benefits to the system in reduced SO2, NOx, particulate matter, greenhouse gas emissions (GHGs), and water use were $258 billion. LBNL also found an estimated $78 billion saved through reduced natural gas use. LBNL expects the 235 TWh of renewables generation needed to meet 2016 mandates to increase to 450 TWh to meet 2030 mandates. That means RPS’s will drive an annual average 4 GW increase of installed renewables capacity, with 18 GW of new installed renewables capacity added by 2020 and 55 GW added by 2030. Most RPS states are either working on "an aggressive path forward or maintaining the status quo," Vlahoplus said. 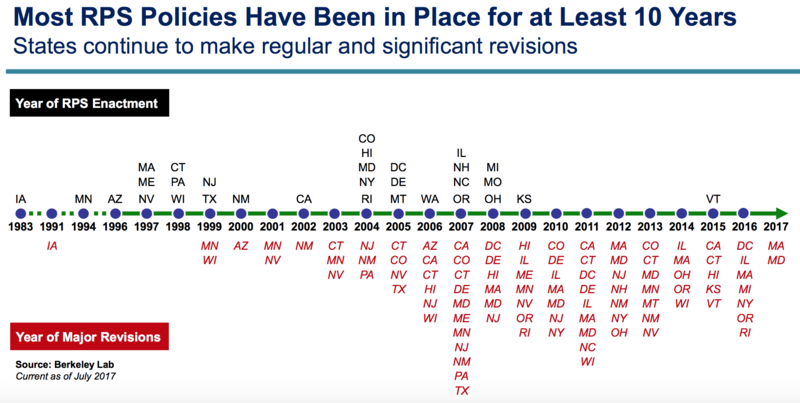 The aggressive states are increasing their mandates, meaning RPS's "will remain a critical driver of renewable energy growth in these states." The status quo states will meet existing mandates, but are only "tweaking" RPS policies, which could reduce their impact "as economic drivers become more important," he said. But in some states,"it is irrelevant that wind and solar produce power cheaper than the regulated utility is producing it," AEE's Woolf said. "The utility can simply continue to rely on existing, if more expensive, resources." The rise of voluntary procurement is impacting that dynamic, Woolf said. A 2016 AEE analysis found the growing number of companies with energy-related internal goals represent increasingly important financial leverage. NV Energy discovered the force of that leverage when it refused to work with Las Vegas's MGM Grand Hotel and Casino, he said. A statewide referendum this year could soon end the utility's monopoly on service and transform Nevada into a competitive market. Nevada lawmakers also passed an increase of the state's 25% renewables by 2025 mandate to 40% earlier this year, Woolf added. Though vetoed by the governor, it was a further indicator of where renewables are going. AEE State Policy Vice President J.R. Tolbert said renewables penetrations in vertically integrated states that do not have RPS’s also demonstrate the policy's importance. Another example is Florida, he added. Without an RPS, its regulated IOUs have allowed some of the nation’s best solar potential go underdeveloped. “That points to another piece of this discussion,” Tolbert said. North Carolina, where the RPS has been weakened by revisions, and Georgia, which has no RPS, both have much more solar than Florida. North Carolina continues to use the Public Utility Regulatory Policies Act (PURPA) and Georgia is growing solar with policies that support distributed generation like third-party ownership. “The RPS has been the baseline policy because it provides market certainty and allows the fastest, smoothest, most continuous growth, but it's not the only policy,” Tolbert said. With the federal tax credits being phased out, the RPS could become even more important, Woolf added. Federal tax credits and state mandates have worked together, said Todd Foley, policy and government affairs vice president at the American Council on Renewable Energy (ACORE). With renewables now becoming cost competitive, and even cost-advantaged, in more states, “you don't need mandates to drive growth in those markets,” Foley said. ACORE’s study of Kansas demonstrates the potential for renewables growth without an RPS, Foley said. But its study of Ohio demonstrates how the growth of renewables, and all the economic benefits they can offer, can be lost without an RPS. Kansas had a 20% renewables by 2020 mandate, Foley said. But because of its potent wind resource, “it was at almost 30% renewables by the end of 2016." The 2009 Renewable Energy Standards Act was created by H.B. 2369. By 2014, Kansas was getting almost 22% of its power from wind. In May 2015, S.B. 91 changed the mandate to a voluntary goal. The legislature voted to terminate the mandate but recognized the value of wind to the state’s economy with “some favorable tax treatment as part of the termination,” Foley said. Getting to 50% renewables would add an estimated 2,650 MW of wind capacity and 110 MW of new solar in the state, according to ACORE. Cumulatively, that would attract over $5.17 billion in investment and economic activity in Kansas. Ohio tells a different story. Since 2008, when its Alternative Energy Portfolio Standard was put in place, Ohio has attracted more than $1.3 billion in asset finance, private equity, and venture capital for renewables, according to ACORE. The result was over 504 MW of installed wind capacity and 125 MW of installed solar capacity. Ohio’s Senate Bill 310 imposed a two-year freeze on growth in 2014. Other provisions limited the positive economic impacts of renewables. In 2016, House Bill 554 would have extended the freeze for an additional two more years, but it was vetoed by Gov. John Kasich (R), restoring the mandate at 12.5% renewables by 2026. The Republican-controlled legislature includes strong renewables supporters who see its significant value to farmers across the state, Foley said. Land leased to developers will be able to continue bringing new tax revenues to economically challenged rural communities. Restoration of the RPS in Ohio, along with other vital support policies, is expected to support over $15.5 billion in projected investment and economic activity in wind and solar, ACORE reported. The result will be over 3,000 MW of new wind capacity and almost 500 MW of new solar. ScottMadden’s Vlahoplus said RPSs can be vital economic drivers but the right combination of resource abundance and alternative policies also works.